This October, Alexandria resident Jane Crawford will be competing in the World Nations Dragon Boat Championships in Kunming, China. 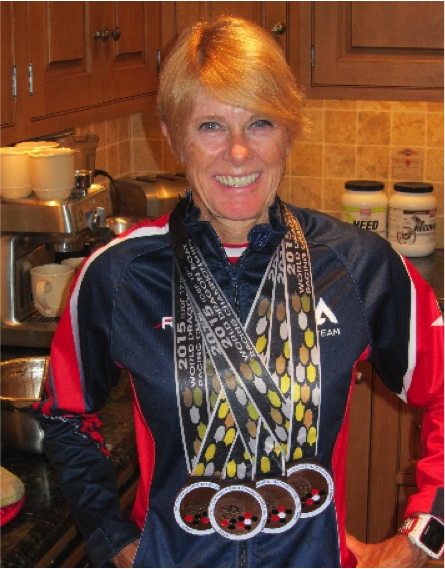 Crawford will be paddling with two di­fferent teams for her Senior B (50 plus) age division, an all-women’s team and a mixed team. This will be Crawford’s second time competing in the championships, having attended the 2015 event in Welland, Canada. Although Crawford has always loved water sports, she found her passion for competitive dragon boat racing as an adult after a period of relative inactivity due to the demands of running her own business. Crawford, a two-time breast cancer survivor, first found out about the sport through a friend who was part of GoPink!DC, a Washington-area dragon boat team for women who have either survived breast cancer or are currently undergoing treatment. “I loved the fact that it was an activity on the water and that I had an immediate connection with this group of women,” Crawford said. GoPink!DC founder Annette Rothermel sees dragon boat racing as a way to provide community support and empowerment to women who have dealt with breast cancer. “It’s not a passive thing,” Rothermel said. “It’s something positive that you can do for yourself. Crawford began her dragon boat journey for purely recreational purposes, but the casual pastime would soon launch her down the path towards elite athleticism. While attending a competition with the mixed team, Crawford recalled meeting higher-level athletes and being inspired. Thereafter, Crawford began to push herself in her training both on and out of­ the water. She began attending group fitness classes at the Sport & Health facility in Old Town to improve her land training. By taking Tabata and conditioning classes with Gonzalez, Crawford was able to improve upon her already strong athletic foundation. Crawford’s coaches and teammates are unanimous in their remarks that what makes Jane an asset to the team is not only her individual athletic abilities, but also her ability to work collaboratively in a group both in and out of the water. Pat Barker, Crawford’s current Team USA coach, echoed those sentiments, remarking that Crawford’s commitment to improving her performance is only matched by her dedication to her team’s success. Some of the challenges Crawford will face in Kunming this October include dealing with altitude changes and readjusting to the rhythm of her fellow Team USA paddlers. Do you have an inspirational story or know a member who has a story to tell? We want to hear about it!